Discover the radical 20th century art movement. This resource introduces cubist artists, ideas and techniques and provides discussion and activities. What is cubism and why was it so radical? In around 1907 two artists living in Paris called Pablo Picasso and Georges Braque developed a revolutionary new style of painting which transformed everyday objects, landscapes, and people into geometric shapes. In 1908 art critic Louis Vauxcelles, saw some landscape paintings by Georges Braque (similar to the picture shown above) in an exhibition in Paris, and described them as ‘bizarreries cubiques’ which translates as ‘cubist oddities’ – and the term cubism was coined. By comparing a cubist still life with an earlier still life painted using a more traditional approach, we can see immediately just what it is that made cubism look so radically different from earlier painting styles. Both paintings are of musical instruments. The first is by Edward Collier and was painted in the seventeenth century. The second is by cubist Georges Braque. Compare the way the instruments are painted in the paintings. Which look the most real? How has Collier made the objects in his painting look realistic? (Look at how he has used shading or tone, colour, perspective and also how he has applied the paint). What rules do you think the cubists broke? His use of perspective to create the impression of a real space with objects in the foreground looking bigger and clearer and objects behind looking smaller and less clear. He has not used perspective, or tone (light and shadow) to create the illusion of three-dimensional space or three-dimensional objects. Although there are lighter and darker tones within the painting, and these do sometimes create the appearance of three-dimensions (a dark tone is used for the side of the mandora making it look like a solid object); the tone is not always used in this way and sometimes seems confusing. The mandora, the objects behind it, and the background all seem to sit on the same level – on the flat surface of the picture, with no foreground or background, and no illusion of receding space. 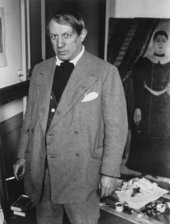 Brassaï, photo of Picasso in his studio at 23 rue La Boétie, standing in front of Rousseau’s Portrait of a Woman 1932. Musée Picasso © ESTATE BRASSAÏ -R.M.N. Picasso and Braque were soon joined in their art adventure by other artists who were experimenting with different ways of depicting the world around them. Artists such as Juan Gris, Albert Gleizes, Jean Metzinger and Robert Delaunay who all worked in a cubist style. Cubism looks very different to lots of other styles of painting. How does it work? What were Braque and Picasso's reasons for turning their back on traditional techniques? How did the cubists develop their new style? Since the Renaissance in the fifteenth century, European artists had aimed to create the illusion of three-dimensional space in their drawings and paintings. They wanted the experience of looking at a painting to be like looking through a window onto a real landscape, interior, person or object. How do you make things look three-dimensional on a two-dimensional surface? Techniques such as linear perspective and tonal gradation are used. Perspective involves making things look bigger and clearer when they are close up, and smaller and less clear when they are further away. By doing this you can create the illusion of space. Artists also use tones (shadows) to create the illusion of three-dimensional objects. By gradually changing the darkness of a shadow, you can make something look solid. These drawings by J.M.W Turner show how perspective and tone (or shadow) can be used to create the illusion of real, solid three-dimensional objects. The cubists however, felt that this type of illusion is trickery and does not give a real experience of the object. Their aim was to show things as they really are, not just to show what they look like. They felt that they could give the viewer a more accurate understanding of an object, landscape or person by showing it from different angles or viewpoints, so they used flat geometric shapes to represent the different sides and angles of the objects. By doing this, they could suggest three-dimensional qualities and structure without using techniques such as perspective and shading. This breaking down of the real world into flat geometric shapes also emphasized the two-dimensional flatness of the canvas. This suited the cubists’ belief that a painting should not pretend to be like a window onto a realistic scene but as a flat surface it should behave like one. Look at this painting by Georges Braque of a glass on a table. Can you spot the techniques he has used to emphasize the flatness of the picture, but at the same time, made the objects look solid? Use these activity suggestions to explore ideas and create a cubist masterpiece updated for the twenty-first century. Braque and Picasso greatly admired Paul Cézanne. Cézanne’s paintings of figures and landscapes are made up of small planes (flat shapes) and repeated brush strokes. They often seem to be painted from slightly different viewpoints. It is this influence that we can see in the work of the cubists. 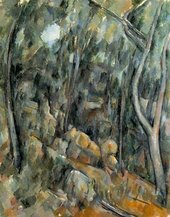 If you look at Cézanne’s painting of trees and rocks in the grounds of the Château Noir, the surface seems to vibrate with a mesh of tiny interlocking planes. Picasso and Braque were amazed by the sculptures they saw in the Trocadero museum in Paris. 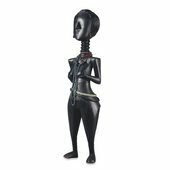 Picasso described sculptures from French Polynesia and Africa as ‘the most powerful and most beautiful things the human imagination has ever produced’. How big do you think it is? Has the sculptor simplified the figure? Do parts of it seem exaggerated or emphasised? What does the sculpture make you think and feel? What do you think the sculpture was originally made for? Create a portrait using sculptures from non-European cultures as your inspiration. This can be a self-portrait or a portrait of someone else. How has the sculptor simplified and exaggerated the forms. What effect does this have on your response to the work? Can you create a similar effect in your portrait? Depicting objects from lots of different angles. In this way they could suggest the three-dimensional quality of objects without making them look realistic. Choose two sections from each original sketch / photograph and put them together to form one image . Open a new image and paste two sections from each original photograph to form your different viewpoint still life. From around 1912 Braque, Picasso, and other artists working in a cubist style such as Juan Gris, started to use simpler shapes and lines and brighter colours in their artworks. They also began to add textures and patterns to their work, often collaging newspaper or other patterned paper directly into their paintings. This approach was called synthetic cubism. Browse the slideshow to remind yourself what it looks like. Create a still life in the synthetic cubist style that explores shape, pattern and texture. Use the three objects you selected earlier, but this time use only flat shapes, simple lines and patterns to depict them in a still life. Here are some ideas. Think about the negative shapes (the shapes left in the paper once you have cut your object out of it). Could you add these to your still life? Look at the shadows made by the objects. How can you make these shadow shapes part of the work? Don’t be afraid to mix media. Use charcoal or wax crayon to draw shapes or details over collage. Use paint to cover flat bright areas, or to add texture or pattern to your still life. If you are still stuck for ideas, this animation may help! Braque and Picasso developed cubism a century ago, but artists and designers have been influenced by the ideas and techniques ever since. How have they updated cubism? How do you think the artist was influenced by cubism? Why do you like the artwork? What does it make you think or feel? Is there anything in the artist’s approach that gives you ideas for how you could update cubism? You have investigated cubist sources and approaches and have researched how other artists have used cubist ideas and style. Now plan your artwork using what you have discovered, and update cubism for the twenty-first century. Braque and Picasso experimented with techniques and approaches. Can you think of ways you could use technology to make a state-of-the-art still life? You should now have plenty of ideas for your updated cubist still life. Picasso and Braque were innovators, experimenting with radical new approaches in the way they depicted the world they saw around them. Their artworks still seem exciting and daring to us one hundred years later. Make sure your artwork has what it takes to inspire others and stands the test of time!